Who: Australian author Carole Wilkinson started her writing career at 40, publishing her first book for young readers in 1996; she has been making up for lost time ever since. Over the past 20 years she has written more than 30 books, including the internationally award-winning and bestselling Dragonkeeper series. Inheritance is her latest historical fiction for young readers. What: Fourteen-year-old Nic is sent to live with her reclusive grandfather at his remote property in the Australian countryside after her father signs up to work on a cruise ship. The homestead was once the childhood home of Nic’s mother who died the day she was born. The house has 30 rooms, sprawling grounds, three dogs but no mobile reception, Internet or functioning television. Left to her own devices, Nic explores the homestead, searching for clues about the mother she never knew. Things become interesting when she learns the ability to leap through a crack-in-time into the past — an ability passed down to the women in her family. With this newfound ability, Nic discovers the dark and shocking secret that haunts the land and the people who live there. Why: Who among us hasn’t fantasised about being able to slip through time? The ability to glimpse what really took place centuries ago and change the course of history makes for a gripping narrative to be sure, and many authors, past and present, have explored this in their work. But the most impactful time-travel tales aren’t about changing the past but exploring it to better understand ourselves and our history. 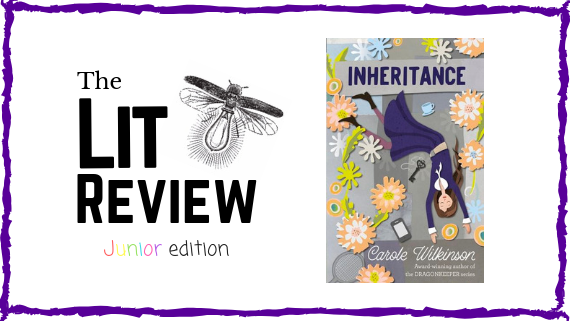 And this is largely the type of story that award-winning children’s book author Carole Wilkinson has written in her latest novel, Inheritance. This compelling yarn confronts Australia’s shameful past in regards to the many instances of senseless, cold-blooded massacres of Aboriginals. It tackles this difficult subject with unflinchingly honesty without degenerating into a story of gory and wanton violence it easily could have. But the emotional scars left behind are very real, and very vividly captured in this authentic depiction of one of Australia’s darkest chapters. Wilkinson weaves the narrative into a story blending intrigue, adventure, supernatural elements and good old-fashioned sleuthing, with a curious, plucky teenage protagonist who has a penchant for the classics (Austen’s novels play a significant role in the plot). It’s a heady but thrilling mix. Ultimately, though, it is an uplifting tale of coming to terms with one’s past — no matter how shocking or shameful — and how, even though you can’t change what happened, you can determine how you respond to it today. Special thanks to Pansing Distribution for a review copy of the book.